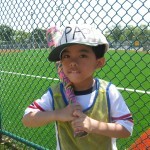 The students at PPA sure did hit one out of the park during I Love My Daddy week! 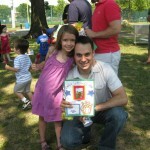 With baseball on the brain, the students worked diligently to create special surprise gifts for their daddies. The school was buzzing with excitement as each little all-star got ready for the Baseball-Themed Father’s Day Party on Friday! Read on to find out about the gifts they prepared for this fantastic day. During morning meeting on Monday and Tuesday, the teachers showed the students an array of baseball collectors cards. Some students said they had similar cards at home and some even had daddies who collected them! The students were elated to find out that they would be making their very own collectors card. 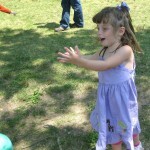 They were even more excited when they learned that they would be the all-star players! During outside play, the teachers called the students over to get their pro baseball player pictures taken in front of the baseball field. Each student dressed up in a PPA baseball cap, held a colorful bat, and struck a pose just like the ones they had seen on the real collectors cards! Once inside, the students had their hands painted with brown paint and stamped one hand print on a page. Once dry, they glued a baseball on the palm and the teachers added strings to make the hand prints look like baseball gloves! In the afternoon on Monday and Tuesday, the students assembled the rest of their collectors cards. 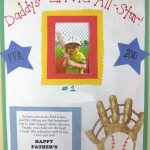 Each card read, “Daddy’s Little All-Star!” and included their photograph, uniform number, and hand print baseball glove! 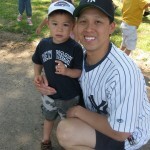 To finish the card, the students glued on a short baseball-themed Father’s Day poem. The students really hit a homerun with this project and were positive that their daddies would be excited to add these cards to their collections! Take a look at the completed collectors card below. The students also worked together to make a list of things they love to do with their daddies! Read on to see what they said! During morning meeting on Wednesday and Thursday, the teachers asked the students to think about something their daddies drink in the morning. Many of the students immediately responded with, “Coffee!” Upon hearing this, the teachers introduced the second project of the week. 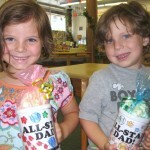 Each child would be creating a mug for their Daddy! The students were bursting with enthusiasm and could not wait to learn about how they would be making such a great gift. During morning work, the students decorated the mugs, which were covered in stars and baseballs and read, “All-Star Dad.” They really did an amazing job making each mug a colorful masterpiece. 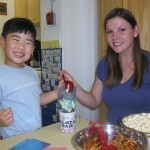 Once the mugs were complete, the teachers asked them to brainstorm a list of foods that can be found at a baseball game. They needed to think of a tasty treat to use to fill the mugs. Some students offered ideas such as hot dogs and snow cones but then giggled at the thought of such foods being stuffed in a mug! After a few silly suggestions, popcorn and pretzels were added to the list. The students could hardly contain their excitement over the additions to the list and so it was decided that the students would stuff the mugs with baggies of cheddar popcorn and pretzels! Check out the finished gift below! 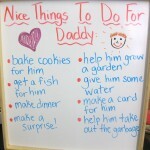 During Wednesday afternoon, the students created a list of nice things they could do for their daddies at home on Father’s Day. Friday morning was spent putting the final touches on all of the Father’s Day gifts and also rehearsing the Father’s Day Song as well as reviewing some important baseball terminology! Hitting off a tee and running the bases! 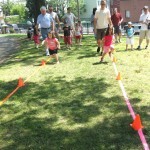 Throwing and catching, and Baseball-themed Relay Races! 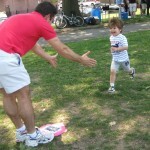 It was tough to determine who was having more fun – the kids or the dads! The dads deserved to be rewarded for being such good sports! The students gathered in the middle to sing a very loud rendition of “Happy Father’s Day to You!” then distributed the gifts they had created throughout the week! The day wrapped up with a special outdoor treat to help cool down after all that fun in the sun! 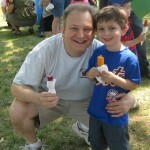 Needless to say, PPA’s Baseball-themed Father’s Day Celebration was a huge hit! A big thank you to all the wonderful Daddy/Grandpas that helped make this week (and everyday!) so exciting! Happy Father’s Day! See you next week as we wrap up the 2009-2010 school year!